Easily schedule, RSVP, and track attendance. Causeway's Calendar keeps all meetings organized in one place. Each committee has its own private calendar, but meetings can be shared across committees. iCal files can be distributed to group members so they can add meetings and events to their personal calendars. Better still, Calendar Streams allow continuous integration with Microsoft Outlook, Lotus Notes, and the Apple Calendar. Users can view the calendar for each of their workgroups individually, or they can overlay meetings from all of their committees into a single display for convenience. For organizations that span multiple time zones, one-click time zone conversions toggles the display to show meetings in their local time rather than a user's home time zone. 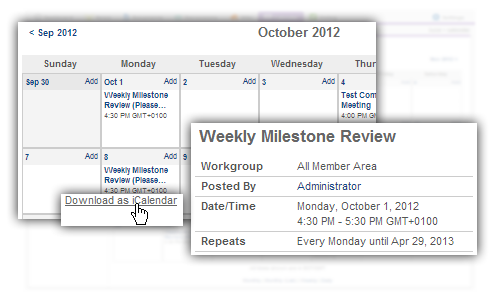 Users can easily review meeting details and attachments by clicking on the title of each meeting on the calendar.